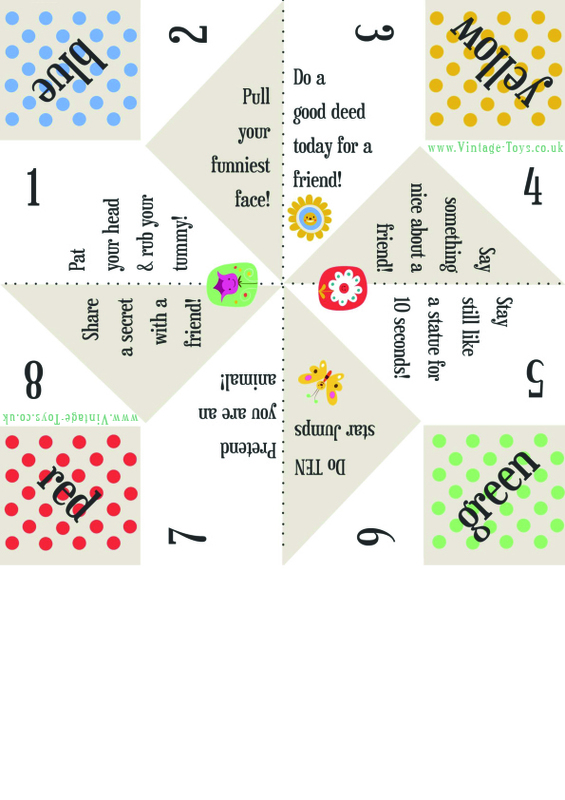 Free Paper Fortune Teller Printable Templates | Welcome to the Vintage Toys Blog! Welcome to the Vintage Toys Blog! ← Festive Sale now on! With so many toys and games for children around these days, it’s easy to forget the simple pastimes of our own childhood created using things that we’d find around our homes. One of our favourites was Paper Fortune Tellers. To make these at home, all that was needed was one blank sheet of paper and with a little practice you’d be making your very own game in no time. Oh, the wonder in taking a very boring sheet of blank paper and turning it into a game that moves as it’s manipulated skillfully your hand. And there are fortunes or challenges hidden inside too – need we say more? 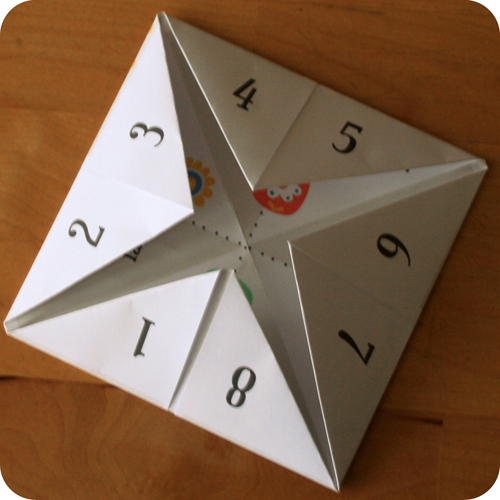 Whilst there are many variations of this game, we always inserted challenges inside the fortune tellers which made for loads of fun when playing with friends during school holidays. So, to bring back some old fashioned fun here at Vintage Toys we’ve produced our own Paper Fortune Teller Templates for you to print out at home and make – choose from our children’s “Challenges” version, or if you prefer to add your own fortunes inside we’ve got a blank version too… perhaps it will tell you your future? First of all, you’ll need to print off your Paper Fortune Teller template. 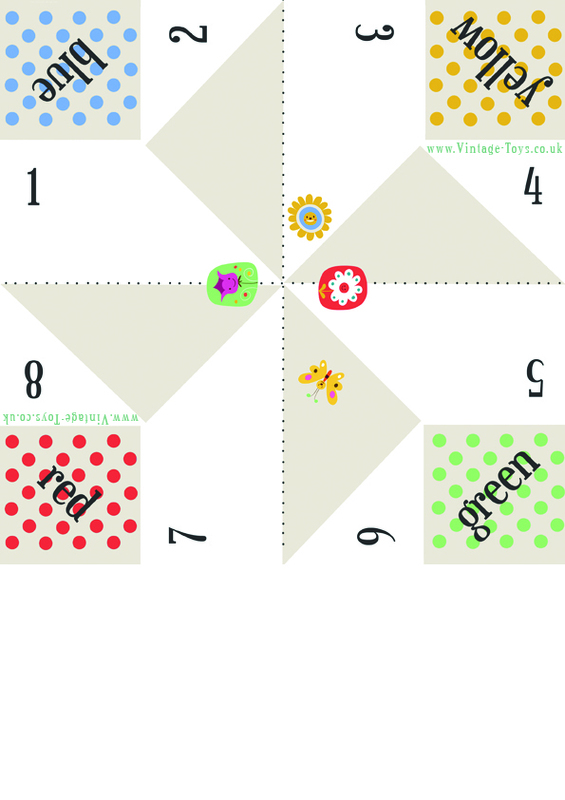 Find the templates below – you can choose from the Paper Fortune Teller – Blank Inside or if you prefer we’ve got a Paper Fortune Teller with Challenges already made up for you ready to go. 1. Starting off with your print out, you’ll need to turn your A4 sheet of paper into a square. Use the instructions above to get you started. 2. Once you have your square of paper, you are ready to get started. Place the square of paper face down so that the blank side is facing you. 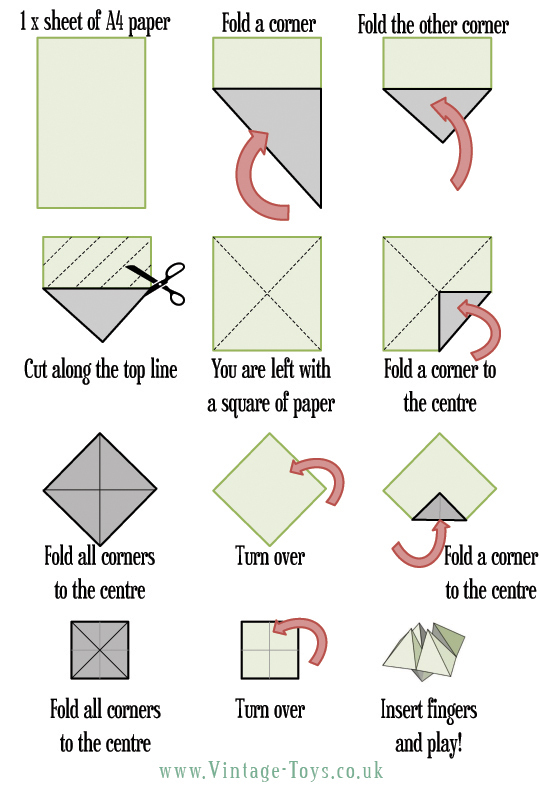 Start by folding all four corners into the centre so that they all meet in the centre point. 4. Nearly there! Now you just need to get your fingers under the coloured flaps and you’re ready to go! One person should insert fingers under the colour flaps whilst the challenger should pick a colour from the four spotty colour choices. 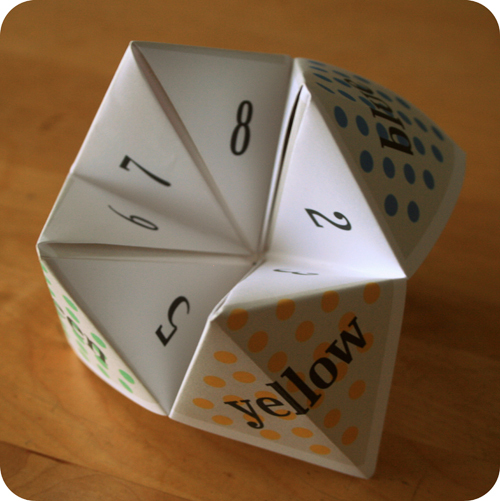 If yellow is chosen, then spell out the word Yellow as you manipulate the fortune teller. Now the challenger must pick a number from the choices available. If the number 5 is chosen, manipulate the fortune teller five times. Pick another number and manipulate the fortune teller again. For the third time, the challenger must pick a final number – they will then look under the flap of this number where there is a challenge waiting for them! Very fun! Thanks for bringing part of the magic of my childhood back to me…at age 50! 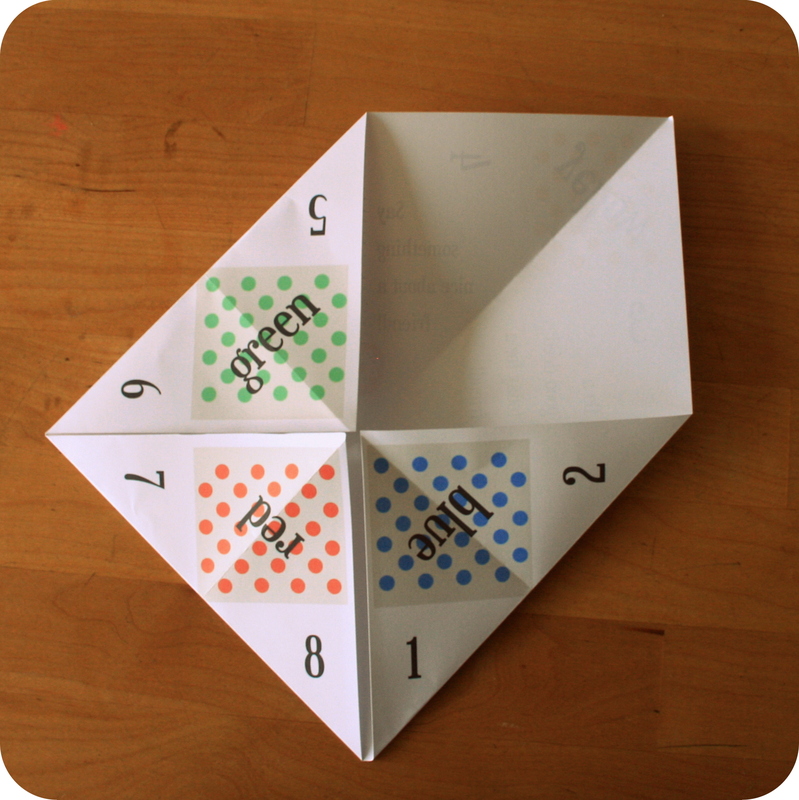 btw, I remebered exactly how to make a fortune teller, even after over 40 years. My family saw an episode of South PRk & asked me if I could make a fortune teller. They gave me a sheet of paper, and I sat down right there in front of them & did it by route memory. They couldn’t believe it! But I could…these are the type of things that your muscle memory stores for you if you do it alot when you are a child. I can still do Jacob’s Ladder using string, as long as I have another person who can help me on the critical step where another pair of hands is required. I enjoyed this. Thanks so very much. Can’t wit to share this with my kids today. Thanks for the templates. I LOVE the memory this brings back to me!! We love bringing back happy memories! Hope they get as much enjoyment now as they did for us when we were little! wow its so good! I made 3 just now, and maybe more! I… I… I just can’t stop its soo good! Thank you so much! A lot of fun for us and for out grandchildren. We had forgotten all about these. Free Gift With Every Order in June! Summer holiday fun the old fashioned way…. Our party supplies have moved to a new home! 1st Birthday Competition – Win a Car!